GLO’s ‘nationwide hotspot’ is a big deal. There are two things I’ve got to give to Globacom, Nigeria’s second national telecommunication carrier. There are bloody spammers as well as innovators in the telco space – at least when it comes to billing. They ‘sachetized’ the phone call with their per second billing. So what is this ‘big deal’ innovation? How it works it simple, you can give anyone on the GLO network access to your Internet bundle. You know, just like you can make your phone a hotspot and ‘share internet”, but this time, NATIONWIDE! There are many ramifications of this type of pricing/sharing feature. 1. Multiple devices become activated. Before now, except you had a device with hotspot ability, the economics of enabling internet on all your devices made no sense. Paying for anything less than 7 GB per SIM card would mean you would be paying an unfairly ridiculous rate for internet access. So for instance, if you had an iPad and a phone, you obviously consumed less internet on your phone. Therefore you would buy say 7GB at about $50 ($7/GB) for your iPad and another $20 for 1.5 GB ($13/GB). Look at the rates and see that it made it painful for people to have more than one connected device especially when you did not need all of the 7GB bandwidth for the iPad. Now, with this feature, you buy at the better rate (the 7GB package) and share on all your devices without feeling ‘cheated’. 2. Nuclear family: The bad economics of buying internet access also affected internet socialism at home. Now spouse and kids do not need to wait for Daddy or Mummy to return before they can use the internet. Buy at the best rate and share for everyone. 3. Far-flung family: To me, this is the most impactful. The other scenarios has at least an alternative. you could use your phone as a hotspot (if it had one) or buy the $150 MiFi device. But for the sibling or family member in another state, there was no alternative. Right now, I can ignore momsie’s insistence on “no need for internet on the phone” and give her access so we can use one of the numerous IMs to communicate. Of course there are limitations presently as this can only work if everyone is using a GLO device. Not a problem for data devices (iPad and Laptop). Another limitation is that you can pair only about 5 devices. I’m sure that can be sorted out in the future. I am imagining what this would do for internet penetration when one account can be use to service a school. 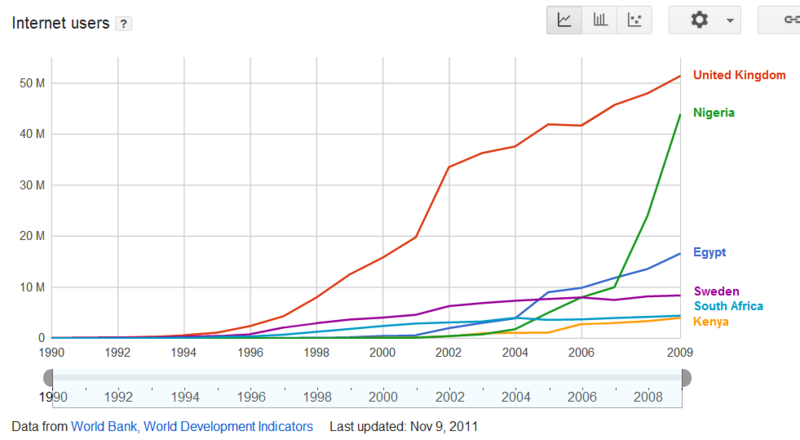 In general, what this means is that there will be more internet consumption and more importantly, deeper penetration. People that had a good reason not to use the net now have less reason not to. I think that is a pretty big deal. Please pardon typos, I just don’t see them. I am doing a music startup and the first comment that comes usually is. “But Nigeria has low internet penetration”. Here’s the graph I try to explain I’m working with. Source. Tomorrow, Nigerian Internet Entrepreneurs will hold a meetup in Lekki, Lagos. It has been a while since my announcing our launch and this is the first activity we are holding. The response to this meetup has been amazing! We sold out (40 tickets) in 4 days! It shows Nigerians are ready. We have really good stuff planned for the ecosystem, we just hope the support needed will come through. I am really looking forward to meeting the guys (where are the ladies pls?
) who have been making things happen here despite the rugged conditions. Nigerians have a lot of potential, we just have to convert it to kinetic.